Dialog Axiata PLC, Sri Lanka’s premier connectivity provider, and Ideamart announced the launch of an aggregate weather solution “WeatherGuru” in partnership with Earth Networks, the largest global hyper-local weather network providing weather intelligence data to organisations and governments worldwide. Understanding the importance of highly accurate weather forecasts and predictions to facilitate safe and productive operations of the aviation, shipping, government, military, agriculture, fisheries and tourism industries among others, WeatherGuru aims to provide fully automated, industrialised weather sensors capable of capturing parameters such as temperature, relative humidity, atmospheric pressure, wind direction, precipitation, UV index and more, including Sri Lanka’s first lightning sensor via weather stations and weather kits deployed island wide. Additionally, using Dialog’s advanced Internet of Things (IoT) platform, both developers and enterprise users will now be able to access real-time weather data, weather forecasts and alerts via APIs in order to create their own, personalised weather-related solutions. Users may also utilise the web-based dashboard to visualise real-time and historical weather data, along with regional and location based weather forecasts and alerts. Moreover, the capacity to combine weather forecasts and alerts with different Telco and IoT services has been made possible with weather widgets on I Say You Do, Dialog’s platform that assists users with automating tasks and activities to create personalised and convenient solutions. Dialog WeatherGuru, along with the Wi-Fi-based and USB-powered weather kits, will convert weather stations which previously required the manual recording, plotting and analysing of data by weather professionals (a time and resource consuming process) into automated stations resulting in the collection of more accurate data at a much faster pace. Real-time weather data collected from multiple smart weather stations will be sent to a single weather platform where forecasting tools combine sensor data with thermal maps and radar and satellite information, to generate more accurate weather forecasts. Further, this information can be produced daily, hourly or as 10-day forecasts, inclusive of weather and lightning alerts. The WeatherGuru also employs Earth Networks’ technologically advanced global lightning network, capable of monitoring in-cloud lightning resulting in the faster generation of localised storm alerts and warnings of severe weather. This extensive weather network, in conjunction with proprietary forecasting algorithms and technology ensure that weather forecasts are delivered on-time and with high accuracy. 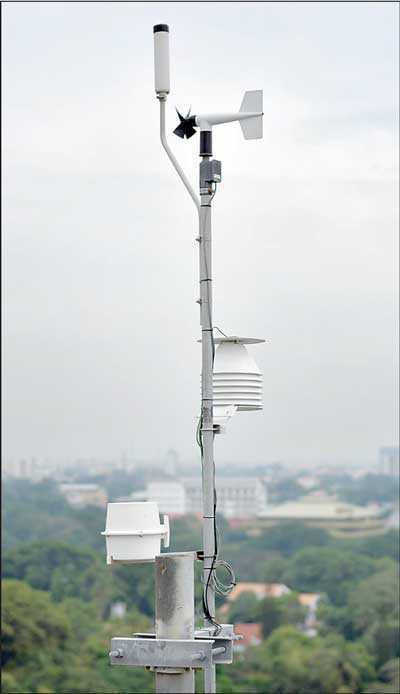 By the end of 2018, a total of 35 weather stations are expected to be deployed across all 25 districts in Sri Lanka.